A reliable approach to IT Services should focus on your entire office and endpoint environment. IT experts should take a holistic approach to improving workflows and processes. This includes examining devices and endpoints, documenting the IT infrastructure, cybersecurity and even environmental impact for a comprehensive approach to all aspects of IT that involve your business. A managed service provider (MSP) such as thinkIT Solutions can help you acquire full control and visibility to your end-to-end IT operations. An MSP can tailor fit an IT maintenance plan and strategy that is a good fit for your business and can improve business operations. While every business is different, the main goals in pursuing a reliable IT Solution are held in common by all businesses: reduce costs, improve productivity (both for operations and employees), and increase the protection of your files and documents. Reliable IT solutions streamline a range of business services for clients in a variety of industries, from healthcare to retail. These services include payroll management, human resources, systems operations, compliance, and network monitoring. 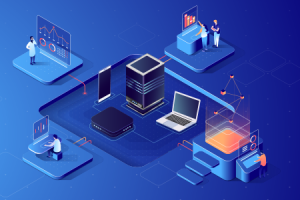 In a recent study, 77% of MSPs provided backup and disaster recovery, 76% specialized in remote monitoring and management, and 57% provided managed network security. Other popular, reliable IT Solutions included mobile device management, payment processing, and hosted and cloud video surveillance. This translates to improved protection for your network, increased safety from external hackers, and even from internal threats. Based on SentinelOne’s Enterprise Risk Index Report (2018), fileless malware makes up about 70% of executables that are unknown to reputation services. If your company experiences this, you should change your IT Solutions provider. thinkIT Solutions can provide options on how to deal with these type of threats. In maintaining your organization’s IT infrastructure, an outsourced reliable IT Solutions provider will typically use advanced technology within your business. You will see rapid results with the newly increased protection and heightened efficiency on offer. To gain these advantages in the face of the general IT skills shortage in today’s market and resulting recruitment limitations, the most progressive thinking businesses and organizations are increasingly turning to a managed service provider for their IT security operations – often even when they already have a contract with another IT service provider. With the constant increase in cyber threats including customer data theft, targeted malware, and ransomware, the need for broader expertise is clearer than ever. Partnering with IT experts, your company benefits from their up-to-date cybersecurity knowledge and the latest technology solutions to proactively monitor and defend your network. With this level of security expertise available, your business’ defenses against IT threats will be stronger, and the risk of serious downtime and data loss minimized. Reliable IT Solutions fully comply with regulatory requirements including industry-specific requirements and current legislation at the local, state, and federal levels. These various mandates must be followed for privacy concerns and legal reasons. Instead of intensively learning the IT security laws that apply to your business and trying to keep up on every development, you might choose to assign responsibility to the provider who then takes care of this area, so you can oversee the process and manage the bigger picture. Put simply, the specialist supplier assumes accountability for the security of your information systems. It includes compliance with legal and regulatory frameworks. Let thinkIT Solution handle the work. Apart from the extra customer support you receive from your provider, you will also have more time to service your client base and see the resulting business growth. thinkIT Solutions will deliver round the clock monitoring, patches, updates, security assessments, audits and deliver timely emergency responses when needed. thinkIT Solutions will examine the technical aspects and oversee the detailed administration of your servers, routers, switching equipment, databases and provide technical management of any hardware including repair, replacement, upgrades, etc. Backup and recovery plans also can be developed as part of the new managed service. thinkIT Solutions is willing to collaborate with any business in search of a new reliable approach to managing their IT infrastructure. With all of the abilities that we’ve mentioned above, you can definitely talk to us and discuss with us if our services are compatible with your needs – try and compare. We are open to sit down and chat to ensure the quality and quantity of services you’ll receive and that it is a good business fit. We have served the New Orleans area since 2001.